Marston’s Brewery was (I think) the first brewery I ever toured, even it was by accident (we broke down in Burton and had some time to kill). Although they’re not exactly a trendy company, they do own a lot of solid brands including Banks’s and Brakspear and are (so Wikipedia tells me) the world’s largest brewer of cask ale. Today’s beer is an interesting example of the damage done by High Strength Beer Duty. Owd Rodger used to be a 7.6% ABV beer, but in more recent times has been slightly reduced to 7.4% – bringing it just under the HSBD threshold. Coincidence? It seems unlikely. 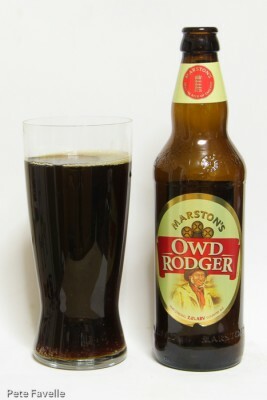 Owd Rodger is described as a “very strong country ale”, and is apparently brewed to a recipe that’s over 500 years old. It’s a dark headless beer with big bubbles, looking more like cola than beer. The nose is sweet and fruity; full of blackberries and milk chocolate covered turkish delight. It’s sweet and syrupy in the mouth; more turkish delight and sugar, with a gentle hop bitterness just barely balancing it out. The finish is short – too short really, as the beer is gone almost before you get to taste it. That said, over time this ale has grown on me – yes, it would be improved by a deeper bitterness to counter all that sweetness, but if it’s purporting to be half a millennium old it’s important to remember that hops weren’t really the mainstay of beer that they have now become. It’s tasty and different, but suffers from being so one-dimensional. 3 stars.